Read an exclusive Response interview with General Keith Alexander. 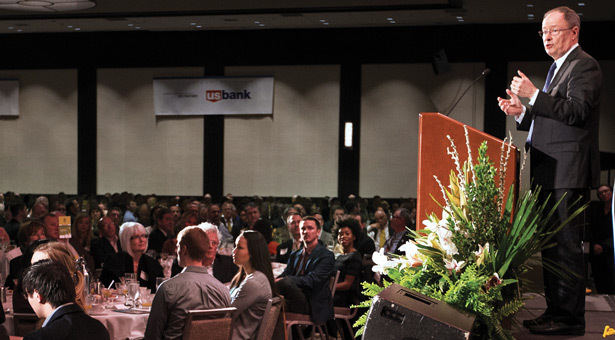 Former NSA director Keith Alexander spoke at SPU's Downtown Business Breakfast held at Seattle's Westin Hotel. Defending the federal government, the nation’s economy, and the personal information of millions of American citizens from cyberattack is an enormous undertaking. As director of the National Security Agency and commander of the U.S. Cyber Command, General Keith Alexander shouldered significant responsibility for the nation’s security from 2005 to 2014. The occasion was the University’s 19th annual Downtown Business Breakfast, where before an audience of approximately 1,000 business, civic, and government leaders, Alexander explored “Espionage, Cybersecurity, and Privacy.” In the audience were such security dignitaries as four-star General Barry McCaffrey, who is a member of the Army Ranger Hall of Fame, and Seattle Police Chief Kathleen O’Toole, along with members of her senior leadership team. Read an exclusive interview with Alexander.